Tom McEvay watches wrestlers prepare for the Alberni Wrestling’s 32nd invitational this weekend. Alberni Wrestling’s 32nd invitational returns to high school roots this weekend. Jan. 22, 2015 8:00 a.m.
Big changes are in place for the 32nd Annual Alberni Armada Invitational Wrestling Tournament taking place this Friday, Jan. 24 and Saturday Jan. 24. In an effort to connect more closely with their roots at the high school, the Invitational has moved to Alberni District Secondary School. It is the first year since 1996 that the tournament has been held at a high school. Because the tourney has been moved, organizers have had to downsize somewhat from the years of more than 600 competitors but this year’s event still expects more than 400 to attend. The Alberni Invitational is widely considered the most prestigious high school wrestling tournament in B.C. and has received recognition across Canada. The tournament started in 1980 and has run every year except the four years the local wrestling group hosted the BC High School Championships (1985, 1998, 2002 and 2008). That means 37 straight years that this dedicated group of volunteers has run a major wrestling tournament in the Alberni Valley. “We are extremely proud of the history and traditions our wrestling program has established over the past 37 years,” tournament director Tom McEvay said. The tournament originated at AW Neill Junior Secondary in 1980. The Alberni Invitational has undergone many changes in its 31 years. 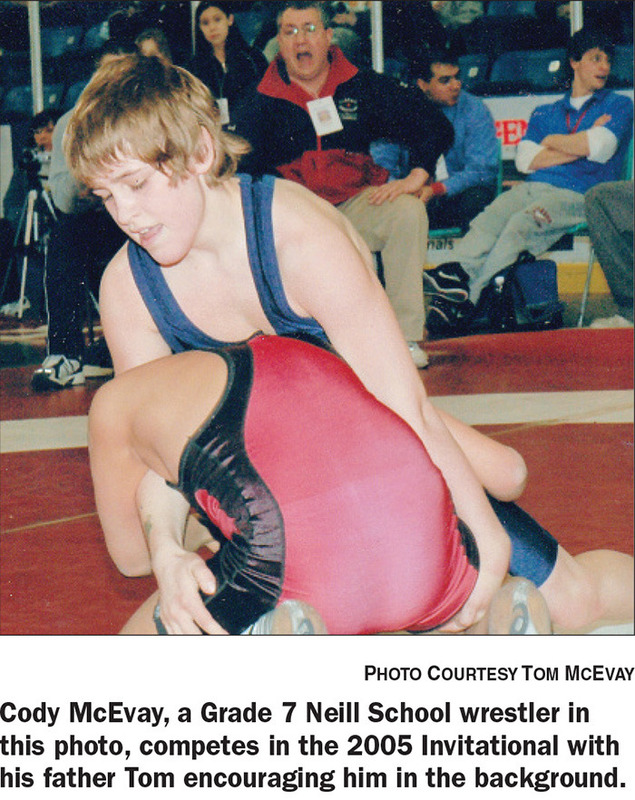 From those humble beginnings with maybe 100 wrestlers on two mats at AW Neill the tournament split age groups and added junior and senior divisions and three mats. This meant it grew quickly to close to 300 wrestlers who needed four or five mats and two days of competition. In 1983 the event moved to Alberni District Secondary. 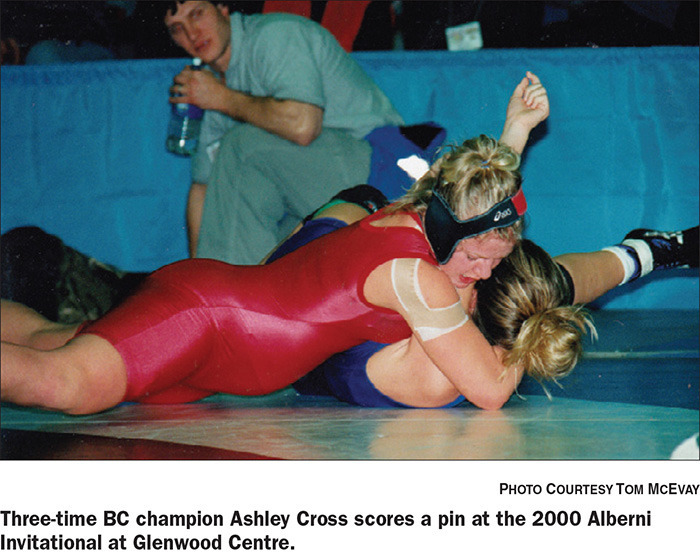 By the early 1990s girls wrestling was introduced in BC High Schools and Alberni Wrestling was a leader and one of the first to add female divisions to the Invitational. This addition and growing popularity of the event meant numbers grew again and were soon well over 500. The Invitational was then too big for ADSS and was moved to Glenwood Centre in 1996, where six mats were possible. With more room at Glenwood the Invitational also added an Open division. With the advent of middle schools in the Alberni School District and in many parts of B.C. the organizers of the Alberni Invitational recognized the developmental opportunity this presented. In 2003 the Invitational expanded to School Age (11-14 year olds), Cadet (15-16 year olds) and Juvenile (17-18 year olds) for both boys and girls. Entries exploded and once eight mats were needed the Invitational was moved to the new Alberni Valley Multiplex. In the immediate years that followed numbers were consistently over 600 and in one year reached more than 700 wrestlers. With space not an issue at the Multiplex, tournament organizers decided in 2007 to add an Elementary division to the Invitational. This event is the culmination of a month long Kid Wrestling program in the Alberni Valley. Each year close to 100 students ages 8-11, enjoy a fun, participation based competition and have the opportunity to feel special as part of the Invitational. This growth pushed numbers at the Invitational to more than 800 and in one year the event was run on 10 mats at the Multiplex. In 2011 the Alberni Invitational was one of the first wrestling tournaments in Canada to introduce a Grappling division. This competition was run for three years with a peak of over 50 entrants, most of them adult competitors. Although grappling added a unique flavour to the Invitational it had some organizational challenges and was discontinued at the event in 2014 to return the event to a school based focus. Several factors have been at play the past year or two that have led tournament organizers to consider some major changes to the Invitational in 2015, McEvay said. “Increased tournament costs, increasing travel costs for visiting teams, concerns over lost school time, less funding for athletics in many participating schools and a realization by those involved in Alberni Wrestling that the event was not maximizing the value it could have to school spirit and awareness at Alberni District Secondary were just some of the variables at play,” he said. The opening of the new ADSS in 2012 with its facilities and the continuing decline in entries at the Invitational pushed the decision to move the Invitational back to ADSS. In order to cap numbers at less than 400 entries the event will be a true Invitational with only invited teams permitted. The schedule will be changed to eliminate the Thursday registration and weigh-in. The Invitational will get underway mid-day on the Friday so teams can travel that morning. Special promotion and activities will be planned at ADSS and will include more school based ownership and participation. “While the past 35 years have seen many changes to the Alberni Invitational and more are coming, the consistent factors have been impeccable organization, tremendous volunteers, incredible community and sponsorship support, outstanding competition and a whole pile of fun,” McEvay said. “Wrestling is a pretty big deal in Port Alberni and the Alberni Invitational is our showcase event. It is our goal to see this event carry on and one day celebrate its 50th anniversary and beyond. Not only do local fans have an opportunity for some great competition at the Invitational, they will once again see very competitive Alberni wrestlers. The ADSS Boys team is currently ranked in the top 5 in the province and will do well at the BC’s, McEvay predicted. In the Juvenile Girls division ADSS is ranked in the top 10 in BC with Carson Graham of North Vancouver, St Thomas Moore and Ucluelet all top contenders. In the Schoolboy/girl division Alberni will have strong teams from Neill and Dunn Middle Schools and both schools should be in the top 10.